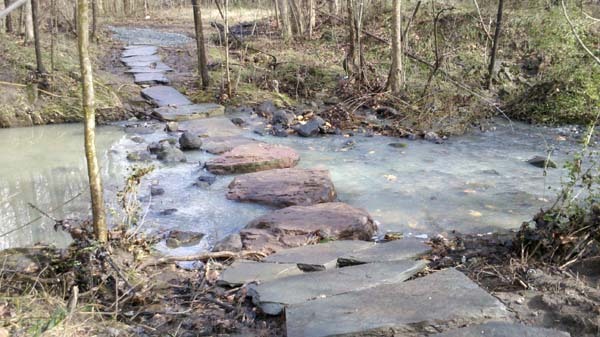 (February 4, 2014) Mecklenburg County's first dirtway is open along Walker Branch and is already being used by hikers. It is slightly over a half mile long and connects the current paved greenway trail at RiverGate to Smith Road. 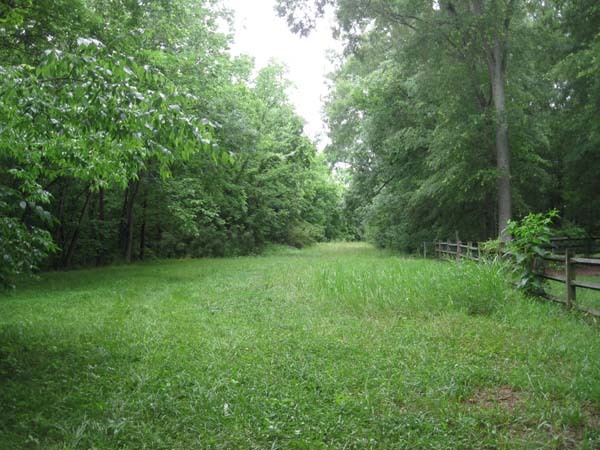 Dirtways are unpaved, rugged temporary trails located on Mecklenburg County greenway property. Near the south end of the current paved Walker Branch Greenway trail, Park & Recreation staff have placed stepping stones across Walker Branch (see below). Except in times of high water, these will allow easy access across the creek. Further down the dirtway, a bridge spans a wide ditch filled with riprap rocks. The full route will be mowed regularly. The dirtway currently isn't marked, but signs should go up this week. Christa Rogers of the Mecklenburg County Park and Recreation Department said "When we were placing the rocks, people were already using them that day so that was cool to see." Walkers and maybe bikers (who may need to carry bikes at some places) should be able to use the dirway, but not users of strollers and wheelchairs. If it's been raining, expect to get your feet wet in the grass or creek. Mecklenburg County Park & Recreation staff plan to open additional dirtways along future greenway routes. The next planned dirtway in the county, along McDowell Creek west of Torrence Creek Greenway, still needs a bridge to be installed before it is usable, so the Walker Branch Dirtway is the first. Because it takes several years for a paved greenway to be developed, dirtways will give citizens an opportunity to enjoy the undeveloped greenway property in the meantime. Dirtways will have minimal maintenance and limited access. They will be mowed and have some signage. Users will cross creeks, ditches, and wetlands over flat stones, concrete pads, or small wooden platforms called bogboards. Trees and brush will be removed where necessary to provide access along the routes. Dirtways will be appropriate for walkers and maybe bikers, but not for users of strollers and wheelchairs. Users should expect to get their feet muddy. There is no dedicated funding for constructing and maintaining dirtways, so the cost will come out of general park operating funds. Dirtways generally will follow the routes of future planned greenway trails, but the alignments could be different in some areas. A temporary bridge had been placed across Walker Branch last summer, but this has been removed. The bridge had a permitting issue that would have cost thousands to keep it. Since the dirtway program is all about opening these stretches with little to no cost, the stones were placed across the creek instead. Another bridge was placed over the riprap further south (this section didn’t need a permit because it wasn’t across the main channel of the creek). The map below shows the current Walker Branch Greenway Trail in solid green. The brown dashed line to the southeast is the route of the newly opened Walker Branch Dirtway. The northern brown dashed line shows the route of an additional dirtway planned between S Tryon Street and Steele Creek Road. County staff hope to open this section soon. Click HERE or on the map to open a larger, PDF version of the map in a new browser window. Voters passed park bonds in 2008 that included funding to build a greenway trail along the route that the Walker Branch Dirtway now follows. Planning for this trail likely won't begin for another year, and construction would occur a few years later. The greenway trail will be paved with asphalt and include a large, substantial bridge over Walker Branch that will accommodate strollers and wheelchairs and can withstand flood waters. North Carolina Department of Transportation plans to contribute to the construction cost, which will allow completion earlier than otherwise. An additional dirtway will be located north of S Tryon St. The land along this route is either already owned by the county or are committed but not yet dedicated to the county. Mecklenburg County has 37 miles of developed greenway trails but only a .4 mile trail in Steele Creek. Trails are slowly coming to Steele Creek, but they are expensive, costing as much as $1,000,000 per mile. The Walker Branch Dirtway is a small advancement towards a greenway network along Walker Branch, Steele Creek, and other routes. For more information, see Mecklenburg County Greenways and Mecklenburg County DIRTways.